But then I had a word with myself. If there’s one thing I hate it’s a food snob. Especially a food snob that has three Chicken and Mushroom Pot Noodles in the cupboard. Cheese-makers have been adding ‘bits’ to their cheese for centuries; classic ‘bitty’ cheeses include Wensleydale with Cranberries and the Dutch NagelKaas with cumin and cloves. And no-one turns their nose up at a Cornish Yarg wrapped in nettles, do they? And, if I’m honest, I love a bit of cottage cheese with pineapple and some of my fondest memories are of the mighty birthday party centrepiece that is a Cheese and Pineapple Hedgehog (and, no, I am not being ‘post-modern’ or ‘ironic’ here, I genuinely love it as a combination). Druidale is a pasteurised cow’s milk block cheese, produced at the Isle of Man Creamery by a co-operative of 57 dairy farmers, all of whom milk their cows less than fifteen miles from the creamery. The origins of the Creamery lie in Douglas where, in 1919, just a dozen cows supplied milk to what was a converted row of houses. However, it’s an ‘incomer’ called Gladys Davies who is seen as the founder of commercial cheese-making on the island. Bringing her skills in Cheshire- and Cheddar- making to the Isle of Man in 1922, Gladys created the recipe for Druidale cheese which, nearly a century later, is now made to the tune of several hundred tonnes a year. And the cheese? Well, for a block cheese it wasn’t at all sweaty when I took it out of the packet, which boded well. 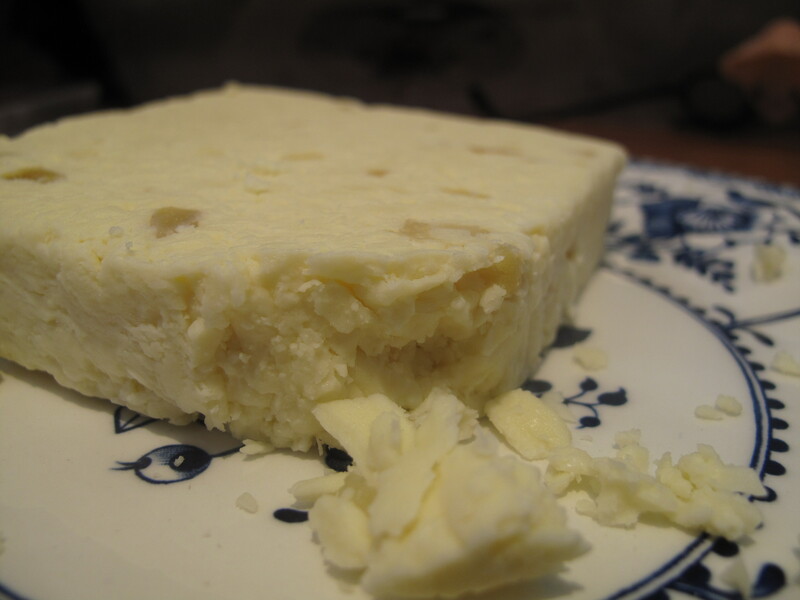 It was very crumby but not too dry, quite creamy and sweet and put me in mind of a Cheshire or Wensleydale. It was very moreish and I ate quite a large chunk of it straight out of the packet. But there was a bit of me that wanted to see what the cheese tasted like without the fruity bits – rather nice, I suspect. I think it depends what kind of mood you’re in, sometimes fruity, sometimes not. But it certainly wasn’t the Fromagenstein’s Monster I thought it might be. It’s only sold on the island or in outlets up north, as far as I can see, so if I want any more, I’ll have to bite my tongue on the ‘Are you related to the Bee Gees?’ gags next time Rachel heads home. The Isle of Man traces its cheese-making history back to the Vikings but my favourite cheese history snippet comes from Manx Notes and Queries. In the eighteenth century, when a woman was due to give birth, people would say ‘There will be bread and cheese in such a house in a short time’. The husband’s primary responsibility was to source a salty Manx cheese and some oaten bread. From when the baby was born until the christening, the mother lay on a sheepskin eating cheese and cake with her friends (much like me for several months after the birth of my children) and pieces of cheese and bread (called ‘blithe meat’) were put around the house for the fairies. The mother then got to continue eating cheese on the way to the church. In the unlikely event I ever again find myself nearing confinement, I’ll be getting a ferry over to the Isle of Man as quick as you like. Like you I don’t normally like the thought of fruity cheese but the way you’ve described this one, I really have to say I’d fancy some right now if only you could send me some through cyberspace! Cheese throug cyberspace… would that make it an iCheese?